all local Chambers of Commerce in Nassau County, NY. The Nassau Council of Chambers of Commerce (NCCC) is an umbrella organization and the united voice for all local Chambers of Commerce throughout Nassau County, New York. We are an extension of local chambers and volunteers dedicated to promoting, protecting and encouraging the success of Nassau County’s business community. Small and mid-size businesses are the life blood of Long Island’s dense population. Nassau County is home to over 90,000 businesses, grossing billions of dollars and the vast majority of them employ 50 people or less. The Council stays abreast of local, regional and state issues that impact the business community. We are a volunteer organization dedicated to addressing workable solutions. 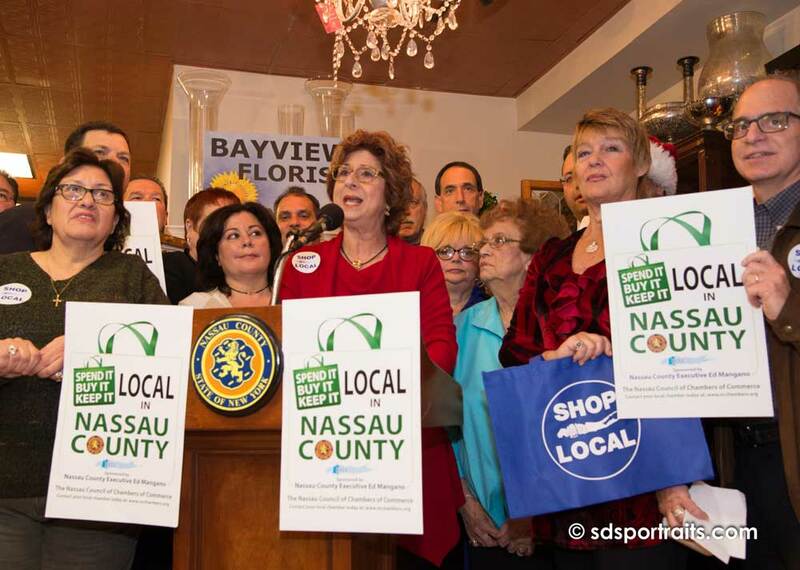 When commerce remains strong and vibrant all people of Nassau County benefit. This Spring come celebrate with us! 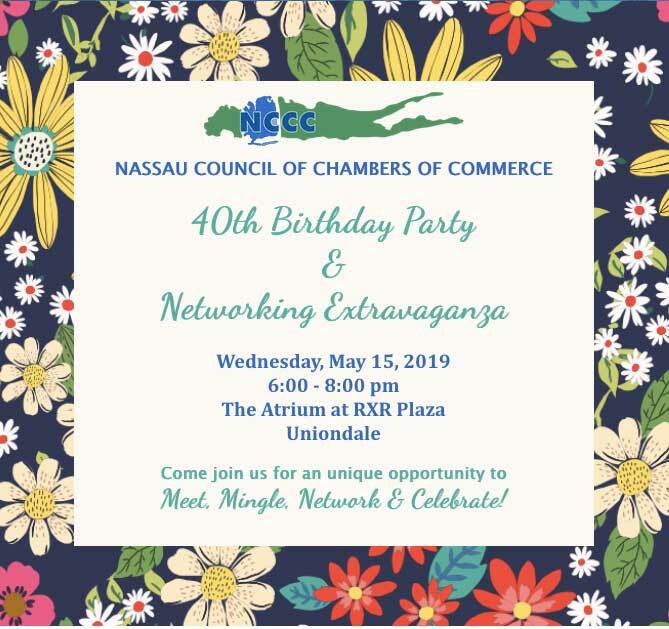 It’s the NCCC Birthday Networking Extravaganza celebrating 40 years as the leading voice of over 40 local Chambers of Commerce representing over 10,000 small businesses throughout Nassau County! Local businesses need local staff; it is that simple. 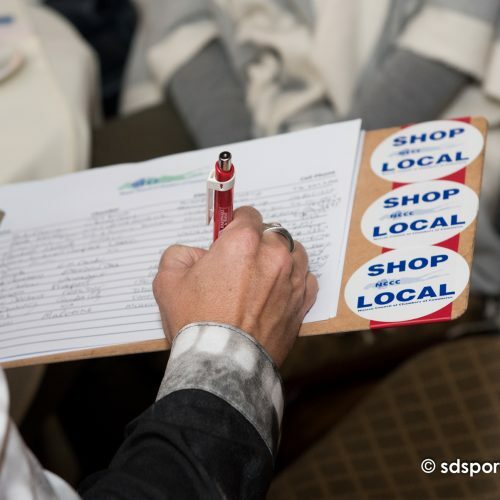 By shopping locally, you are helping the shops and companies in your community to grow, which in turn leads to increased revenue, higher recruitment and more career opportunities opening up for everyone. Look at it this way: $10 million spent at local businesses generates 57 new jobs. The same amount spent at an online retailer like Amazon creates just 13 jobs. I opened my business in 2005 and was new to Plainview. A few months after I joined the POB Chamber of Commerce and met the president and board of directors and president at their holiday party. I wanted to get involved in the town where I had a business but was a bit shy about walking in someplace not knowing anyone. But once I joined I was so surprised that it is a welcoming, fun and a positive way to meet people. 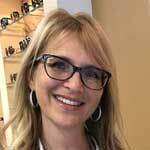 Not only have I made more business contacts and customers but I also developed friendships made through the many business networking events I attend. More business didn’t immediately materialize overnight because it takes work to build relationships and trust. I have been involved in the chamber ever since and would encourage every businesses (old and new) to join and become active in your local chamber of commerce. It works! "A big thanks go out to all my chamber friends and family for your support of me, my business and attending my chamber open house. All while I was recovering from heart surgery in 2016. To this day many still ask how my health is. They don't forget, they don't stop caring."